GBPUSD is under the influence of Services PMI and the U.S Non-Manufacturing PMI on Tuesday. 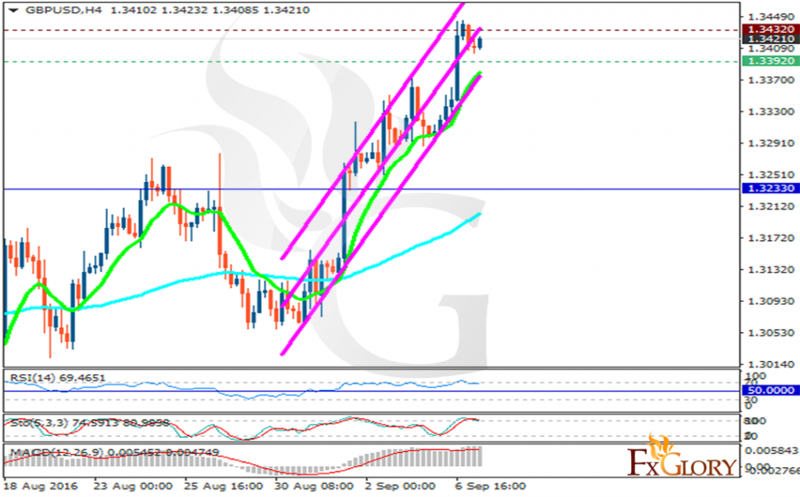 The support rests at 1.33920 with resistance at 1.34320 which both lines are above the weekly pivot point at 1.32330. The EMA of 10 is moving with bullish bias along the ascendant channel and it is located above the EMA of 100. The RSI is moving above the 50 level in the over-bought area, the Stochastic has reached its maximum rate and the MACD indicator is in positive territory showing the price growth. The pair may not rise further so short positions are recommended with the target at 1.3360.